﻿ Arc Segment Actuators by Motran Industries Inc.
Motran Industries Inc, is an Industry leader in the design, development, and production, of compact, high output Arc-segment Actuators. 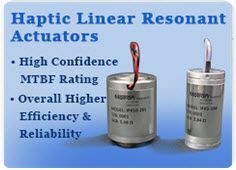 These linear motors have from 30 to 38 degrees of travel and develop from 4 to 15 ounce inches of torque, with resistive position sensing capabilities incorporated into each individual unit. The primary application for these devices is for use in guidance system platforms. Description and performance data are listed below.